Today we have some great news especially for those of you who own or plan to own a Chromecast, it’s only $29.99 at Amazon right now, usually it costs $35 so get it now before the price goes back up. If you own a Chromecast, you can now use it along with your Microsoft OneDrive App! Microsoft has finally updated their OneDrive app for Android with Chromecast support/Google Cast support as others officially call it. You can now cast photos and videos from your OneDrive account to your Chromecast connected TV or Monitor with ease. Of course most of you reading this probably use GoogleDrive, myself included but now we have more options and more options are always good. 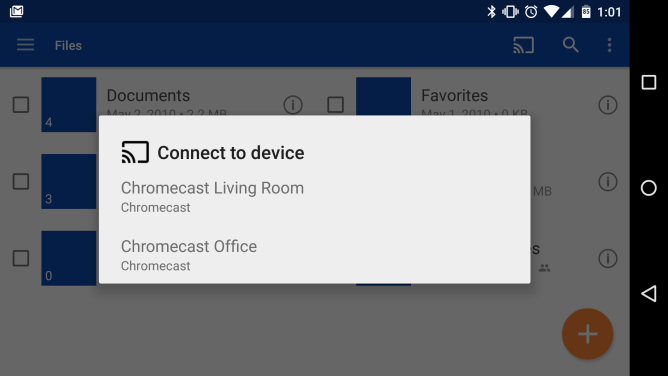 Let us welcome OneDrive to the Google Cast family, this might actually make GoogleDrive work a little harder on their next update to impress us.